Abdul Mohsen Al Husseini, an MIT Mechanical Engineering Master’s student and a 24 year old Jordanian national. In addition to his Master’s research at MIT’s Space Nanotechnology Lab, Abdul Mohsen Al Husseini was a member of the MIT group participating in the Google Lunar X-Prize competition. He is also a co-inventor of MIT's low-cost ventilator, a project that aims to provide affordable life-saving ventilation for resource-poor regions worldwide. After working there as an intern, he will rejoin NASA full-time after completing his Master's degree later in 2011. Abdul Mohsen Al Husseini plans to obtain a doctorate degree in Aeronautics and Astronautics. Longer term, Abdul Mohsen plans to pursue a space-research focused career, which includes a personal goal of co-founding the Middle-East's space agency. 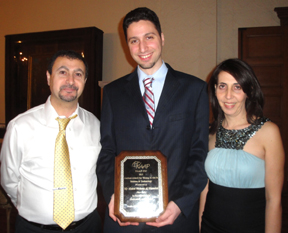 As the winner of the Award this year, Al Husseini received a cash prize of $1,000 along with a new Apple iPad.